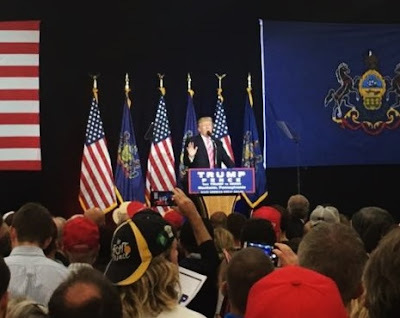 Pierson Caster's photo of Donald Trump at the recent Spooky Nook Sports Center rally. Because of bad weather, Donald Trump arrived at the rally slightly late...like an hour and a half late. When he came onto the stage, everyone jumped to their feet in order to get a glimpse of the orange man himself. It appeared as if he were reading a teleprompter 30% of the time, for the majority of his speech consisted of nothing but rambling. For example, he blamed his horrible debate performance from earlier in the week on a bum microphone. Then, when talking about trade, he said, "They don't make movies like they used to. What a difference!" If there was any one prevailing theme throughout Donald Trump's speech, it was the idea that he is not an establishment candidate and that Hillary Clinton is: "Clinton and her cronies will say anything, do anything, lie about anything to enrich themselves and keep their grip on power. The American people have had it with decades of Clinton corruption and scandals." He continued to bash the Democratic nominee mercilessly. It was quite entertaining! He told the audience, "Hillary Clinton's only loyalty is to her financial contributors and to herself. I don't even think she's loyal to Bill if you want to know the truth." All in all, it was your typical speech by Donald Trump. It had its fair share of self-worshiping, Obama-criticizing, and Clinton-insulting. Trump closed his speech by stating, "We are going to do something that this country has never seen before. This movement is special; the people are special. We are going to make America wealthy again. We are going to make America strong again. We are going to make America powerful again. We are going to make America safe again. And we are going to make America great again." It was certainly an interesting event, but it did not change my view of the presidential candidate in the slightest. Disclaimer: I am a Republican who believes in conservative values, such as limited government and liberty. I don’t support Donald Trump. I just don’t support Hillary Clinton more. My problem with Trump is not so much his proposals but rather his lack of principle.